Exactly as described! A little larger than expected, which is good. Latches to hold the top on don't work but that is fine. Easier to remove the lid and scoop. If not for the latches I would rate a 5 star. Would buy again but looks like it will last a loooong time. Space saving design! The Petmate® Hooded Corner Litter Pan has a space-saving shaped design that allows you to take ususable corner space and place it easily in any corner of your home. 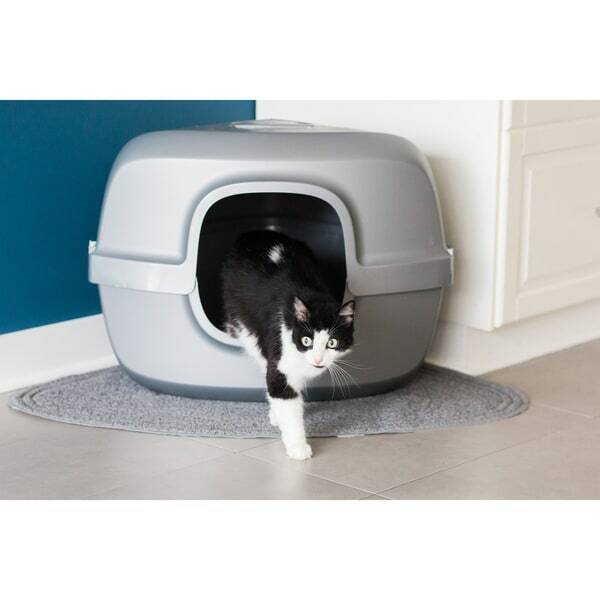 The hooded feature reduces cat litter scatter while the low front entry makes access easier for older cats and kittens. Constructed of durable plastic with a reinforced bottom, the Hooded Corner Litter Pan has two latches that hold the hood and base together. The hood and included odor-absorbing replaceable carbon filter partner together to help eliminate odors to keep your home smelling fresh. Ideal for cats that like to dig in the litter. Dimensions 26.0 In. X 19.0 In. X 19.4 In. I love this litter pan and so does my cat and this is her first experience with any litter box. She is 6 mo old and had been dropped off at my barn. The vet told me she might be hard to litter box train but she took to this one immediately. I would recommend this to anyone with a cat.